Super Bowl and… Buffalo Wings! Chicken wings aren’t something I thing about eating very often, but I dearly love them. They are one of those foods that I always link with good times, like the Super Bowl. I love chewing on the tips and bones until there is absolutely nothing left. Sadly, it is becoming increasingly difficult to buy wings with the wing tips included… Such was the case when I set out to purchase wings for Super Bowl snacking and had to settle on just drummies. They are still good, but just not the same. Cooking wings can be a greasy mess, so I try and keep the process as simple as possible. Here’s my Buffalo wings solution. I brine the wings overnight and precook them ahead. When ready to eat, it’s a simple matter of gathering everything together and finishing them on the grill or in a hot oven. The most important trick to their success is to saturate them well with wing sauce while they are as hot as possible. It soaks in and does not make them soggy. 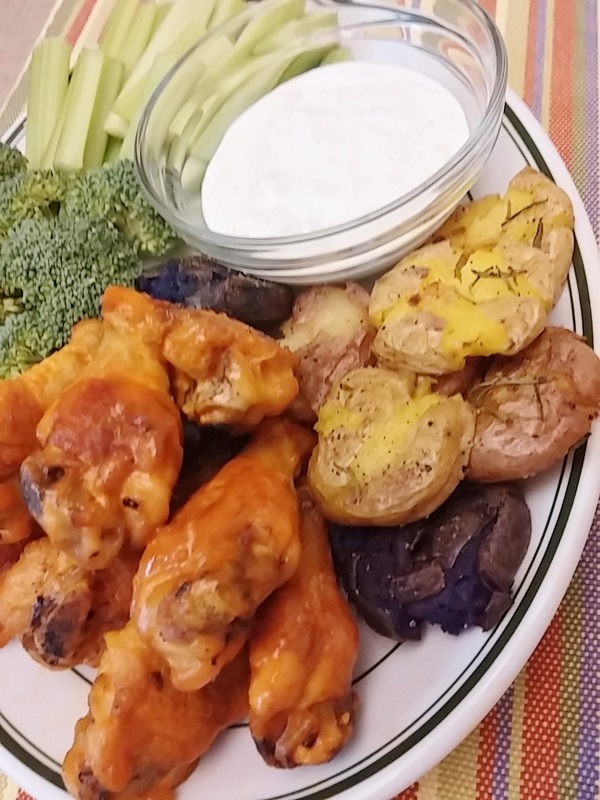 I especially like homemade blue cheese dressing with the wings, but any will work. It is the perfect balance with their hot spiciness, as well as an excellent dip with crunchy celery and broccoli. With just a few vegetables thrown in, somehow we can believe we are eating healthy. For an add-on, serve these with the smashed creamer potatoes mentioned in the previous blog entry. 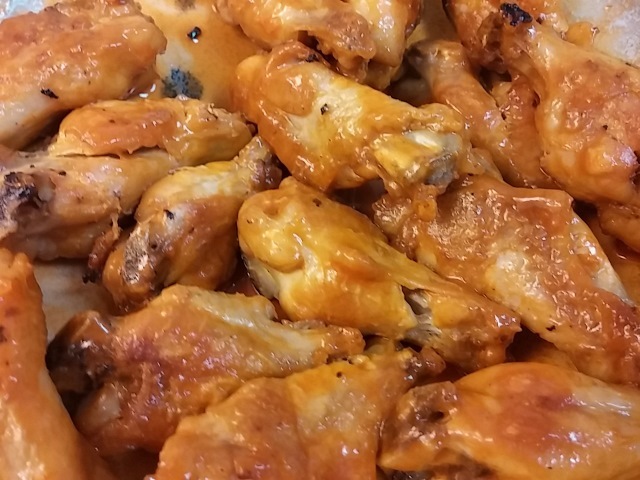 Enjoy, because it wouldn’t be Super Bowl without wings. In a sealable container or zip lock bag, combine the salt and enough warm water to dissolve, add the garlic and water to cool. Add the wings and water to cover. Let stand overnight in brine. The next day, drain and air dry. Preheat oven to 450° and line baking sheet with foil. Precook the wings for 30-45 minutes until they begin to color. Set aside until ready to finish. For sauce, melt the butter, add the garlic and sauté 2 minutes, add the hot sauce and adjust flavors with a bit of soy sauce and vinegar. Set aside until ready to finish. Finish the wings on the grill or in 450°oven for approximately 15-20 minutes, until well browned and crisp, turning as needed. While hot, toss the wings with sauce and serve. Traditionally served with celery stick and other fresh vegetables and blue cheese dressing. Serves 6.